Californians love renewable energy. In fact, California just became the first state to require solar panels on all new homes. But the new requirement creates questions—How will the new law complicate the electricity market? What strains will it place on existing distribution networks? The problem, according to the researchers, is that the organizations overseeing the grid as a whole, known as independent system operators, or ISOs, do not dispatch, and often can't see, the location of network DERs. They only see transmission lines and resources connected to them, such as collective demand at the substations and power plants. They determine market conditions based on the big picture without knowing details that might have important consequences in the power grid. 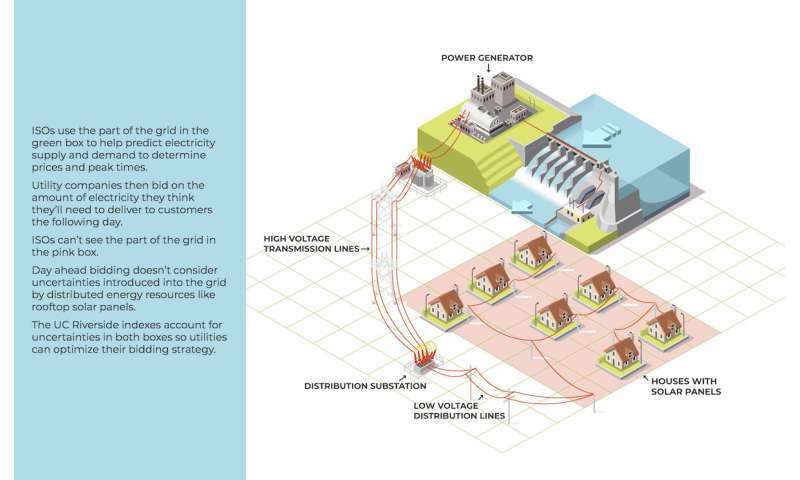 "ISOs see the electricity up to the substation that feeds it into a consumer network but are blind to what happens among the thousands or millions of customers after that point," explained Ashkan Sadeghi-Mobarakeh, a UC Riverside doctoral student in electrical and computer engineering and first author of the paper. "The demand of each customer at each location has a different local impact on the distribution network." California ISO, or CAISO, has introduced a new index to better manage flexible and responsive loads according to the market conditions. But the index suggests deployment of flexible loads only according to market conditions, meaning CAISO's index doesn't consider that market participation of DERs located in distribution networks may push a network's limits. Sadeghi-Mobarakeh used novel algorithms to model cost and electrical loads in different market scenarios and tested them on a standard distribution network. He used his algorithm to compare the cost and stress on the distribution network to what would be predicted by the conventional model. He found that if the utility company had bid according to his model, they could have delivered power to consumers at considerably lower cost on many days, with less risk to the network. "The indexes proposed in this paper can be combined with field measurements from smart meters at substations to measure in real-time the collective impact distributed energy resources have on distribution system reliability," Sadeghi-Mobarakeh said. The paper will appear in an upcoming issue of IEEE Transactions on Smart Grid.